At their May 1977 graduation from Duquesne University's School of Nursing, Nancy Shakarian (Murphy) and Robert Murphy never could have guessed that nearly 40 years later they would be back at Duquesne not only celebrating their daughter's graduation from their alma mater, but having the opportunity to "pin" her at the School of Nursing diploma ceremony. This Saturday, May 13, the Murphys will participate in the Duquesne University nursing diploma ceremony and pin their daughter Emma at 3 p.m. in the A.J. Palumbo Center. 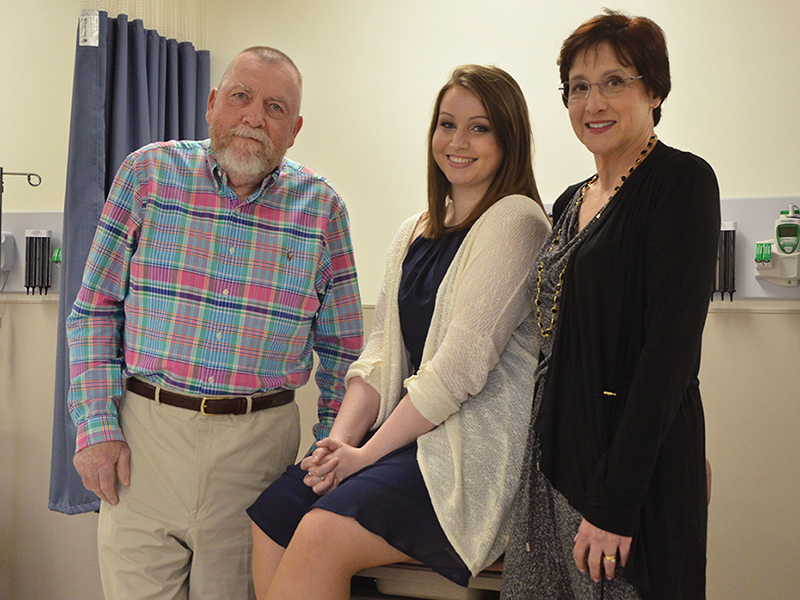 "I'm so thankful that I have such accomplished, amazing parents who graduated from Duquesne University's School of Nursing 40 years ago, almost to the day that I am graduating," says Emma. "To have them pin me at my graduation as I move on to the next chapter of my life as a Registered Nurse means the world to me. I can only hope to be as special of a nurse as I know they both were." Robert, who'd been in the Navy prior to starting nursing school at Duquesne, worked as an RN on various assignments at naval hospitals in Great Lakes, Il., and Beaufort, S.C., before returning to Great Lakes to be an instructor at Naval Hospital Corps School. Nancy traveled with Robert to his various Navy assignments and worked as an RN for the Veteran's Hospital in north Chicago and then as a visiting nurse for the Beaufort-Jasper VNA in Beaufort. The couple returned to Pittsburgh in 1983 so Robert could attend Duquesne University School of Law. After his 1987 graduation, he remained affiliated with the Naval Reserve of Pittsburgh until his retirement from the Navy in 1997 as a commander, Navy Nurse Corps, U.S. Naval Reserve. Today, he works as an attorney in private practice. Nancy worked for several years with the Visiting Nurse Association of Allegheny County and served as operations manager there until 1993. "I know that my parents were a couple of the best nurses the world has ever seen; they are both so hard working and comforting," adds Emma. "They are truly are my role models. They, along with my brother Bart, have been there for me every step of the way through nursing school, and I could not have done it without them!" After graduation, Emma will start a new job as a nurse at Jefferson Hospital's ICU step-down unit. The Murphys reside in Upper St. Clair.